NOTE: This page refers to the Mac version of iPhone Data Recovery. If you want to Run the Application on Windows Instead, Click Here to View the Windows Version. The SpyGearCo iPhone Data Recovery For Mac is used as a cell phone tracker (mobile phone tracker), to keep track of children's safety. We have received emails from happy customers who were able to trace bullies and prevent abuse. Not only is it used as parental control software, but also to establish a partners' or employee misconduct. It is used as spy software, to spy on mobile phones. Unlike other monitoring software, iPhone Spy Recovery goes back in time and shows historic activity, including data which has been deleted from the device. The iPhone Spy Recovery is available as an instant download. It does not require the phone to be jailbroken, so there is no loss of warranty. The software also does not require installation on the phone. In fact, it does not require access to the phone, if you have an iTunes backup on your Mac. The software will also leave no trace on the phone, and is purchased as a life-long license, so there will be no monthly fees incurred. Because it's a digital download, there's no physical shipping time and shipping costs. You still keep your phone, so you don't need to send it to data recovery agencies. There is no waiting time. Your private data will be handled by you only. Monitor iPhone, iPad and iPod Touch Activity with the iPhone Spy Recovery. This software can recover data either directly from the device, or from an iTunes backup file, even if the data has been deleted from the device. 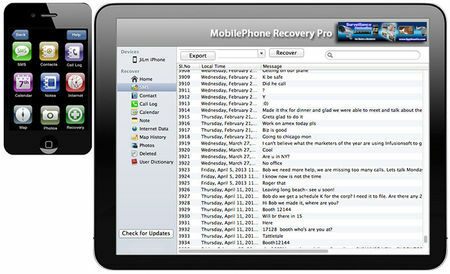 Recoverable deleted data includes Text Messages, Contacts, Call History, Notes and Calendar. This is the ideal child monitoring software for parents who are looking an efficient tool to monitor their child's iPhone usage. Also, because the software is able to recover historical data from before it was purchased, parents are presented with a full picture of the device's use, both past and present. This is also an essential tool for employers who issue employees with company owned handsets, and can be used to make sure that employees are using their devices appropriately. The iPhone Spy Recovery is a simple to use tool and will show all data found in an easy-to-manage interface on the Mac. Data can then be exported to a location of your choice on the Mac for future use or to keep it as a record. To activate your software, simply enter your activation code to unlock all features of the software and access your data in full. The SpyGearCo iPhone Data Recovery For Mac is the ideal tool for parents to monitor their child's iOS devices. With the rise in child and teen bullying via smartphone, it is important that parents are able to keep track of any potential issues that their children might encounter whilst using their smartphone. The software can be used by connecting the device directly, or by reading an iTunes Backup File (created by syncing the device via iTunes). The software will not jailbreak the device and also does not require the device to be jail broken, so the manufacturer's warranty will remain intact. 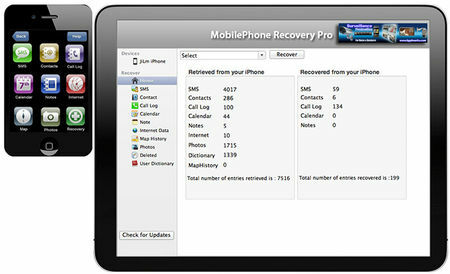 The SpyGearCo iPhone Data Recovery For Mac can also be used as an employee monitoring tool, on company owned handsets. This is particularly useful in making sure that employees are using company owned devices in an appropriate manner. The SpyGearCo iPhone Data Recovery For Mac is used as a cell phone tracker (mobile phone tracker), to keep track of children's safety. We have received emails from happy customers who were able to trace bullies and prevent abuse. Not only is it used as parental control software, but also to establish a partners or employee misconduct. It is used as spy software, to spy on mobile phones. SpyGearCo iPhone Data Recovery For Mac is also the best tool to finding out if your partner is having an affair and cheating on you. Most often the cheater will set up a place to redevous via a text message to the other person and then delete the message. Now you can get proof that he or she is cheating on you! Unlike other monitoring software, SpyGearCo iPhone Data Recovery For Mac goes back in time and shows historic activity, including data which has been deleted from the device. Instantly download the SpyGearCo iPhone Data Recovery For Apple Computers to find out what a person is doing on their iPhone®. You will receive your activation code approx. 24 hours after your order along with the link to download your product. Before the SpyGearCo iPhone Data Recovery For Apple Computers, owners of all iPhones up to iOS 7.0.4 had to rely on devices that only worked on PC's and not Macs. Now you can perform forensic data recovery on any iPhone on any recent Macintosh computer! As a lifetime Mac Addict, I hated that you could not see what your spouse, kids, or employees are doing on their iPhone if you only had an Apple computer. You had to buy some PC just for this, costing hundreds of dollars! The SpyGearCo iPhone Data Recovery For Apple Computers is an instant download that you transfer to a 500MB or larger flash drive so you can covertly monitor all iPhone usage on the suspects iPhone. This iPhone data recovery software is the first to be compatible with all recent Apple computers. Like any other iPhone monitor, the SpyGearCo iPhone Data Recovery For Apple Computers relies on the back-up files that iTunes creates, so the phone has to be updated in order to get the most recent data. With the SpyGearCo iPhone Data Recovery For Apple Computers, we give you immediate download of your product, and once we send you your serial number, you can either install it on the Mac that iPhone syncs up to, or, get a 500MB flash drive from Target, or use one laying around, and load it on there for the most stealthiest way to see what they are doing. Shortly we will offer the flash drives with it loaded on it, though why wait, go get a 500MB or higher flash drive at any Target, Walmart, Costco, etc for a couple bucks. Software can be used on an unlimited number of iPhones, iPads, and iTunes backup files. The SpyGearCo iPhone Data Recovery For Apple Computers is ideal for parents, business owners, or law enforcement. With this software, you can perform forensic examination of deleted files on the phone based on the past back-ups to the persons computer, all the way back to the first time the phone was backed up. Like all iPhone recovery devices, you use the back-ups when they sync to their own computer to find the deleted data, as well as view what is currently on the phone, including Contacts, SMS text messages, call history, calendar items, photos and notes. All this is critical evidence that could be deleted from the phone while the person has it in their possession. You can view not only the current info on the iPhone by clicking on the iPhone icon on the opening screen, you can also click on the computer button to view all back-ups since the very first one. Connect the data transfer cable that comes with the iPhone between the iPhone and PC with our recovery software installed on it. Ensure that the latest version of iTunes® and Quicktime is installed on your Mac. Turn on your iPhone® handset. iPhone® auto lock is set to "NEVER"
Data Recovery - Recovering data from the iPhone®. Click on the iPhone® icon from the main screen. The application will check for the iPhone® connection. If detected, it will open the data recovery screen. Please note that if your handset has a large amount of data stored, it can take several minutes to fully scan the contents of your handset. For extra security and peace of mind, the data in your iTunes® backup folder is not used to recover data from the iPhone®. 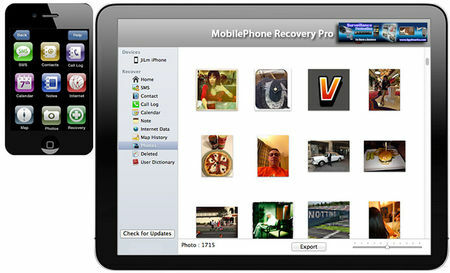 The MobilePhone Recovery application creates a snapshot (a duplicate copy of your iTunes® backup folder). It is this snapshot folder that the software uses to display the data from your iPhone®. 1. Click on the Mac icon from the main screen. Select one of the three plist files and click open. Depending on the users requirements, they can click on any of the icons on the iPhone® to go directly to that feature (SMS/Text Messages, Contacts, Call Log, Calendar, Notes, Internet Data, Map History, Photos, Recovered, DeviceInfo and User Dictionary). Clicking on the Recovery icon will recover and display deleted SMS History, Contacts, Call Log, Calendar & Notes from the iPhone® or iTunes® backup file. Clicking on the device name displays the device information. This information is only displayed fully when accessing the iPhone® directly. You can also click on the tabs at the side of the information screen to view the desired data. You can search the all text based tabs by letter or word. To hide the data recovery screen, the user must click on the Hide icon. Click browse to navigate to the destination folder, name the exported file. You can then open the file to view the information. If you are updating a folder from a previous export, please check the box "Replace if exists"
Problem: The iPhone® has stopped working. What do I do? Solution: Reset the iPhone® by holding down the sleep/wake icon at the top right of the device and the home icon at the bottom center of the face at the same time. Problem: The iPhone® doesn't connect to the Mac. What do I do? If that doesn't work, disconnect other USB devices from your computer and connect the iPhone® to a different USB 2.0 port on your computer. If that doesn't work, turn the iPhone® off and turn it on again. Press and hold the Sleep/Wake icon on the top of the iPhone® for a few seconds until a red slider appears and then slide the slider. Then press and hold the Sleep/Wake icon until the AppleTM logo appears. If that doesn't work, restart your computer and reconnect the iPhone® to your computer. If that doesn't work, download and install (or reinstall) the latest version of iTunes® and Quicktime. Problem: The MobilePhone Recovery will not read my backup file on my Mac? SpyGearCo's liability will not exceed the purchase price of the software. Due to the nature of the software, we do not offer refunds if after purchasing an activation code, particularly if you change your mind or find that the software is not suitable for your needs. It is your responsibility to ensure that the software is suitable for your needs.